Discussion in 'General Ranchero Help' started by Doc76251, Apr 8, 2019. Does anyone have any experience with AOC (ACC) or Stockinteriors carpets? Both are reasonably priced and both offer EVA backing. Anybody have actual hands on install info? 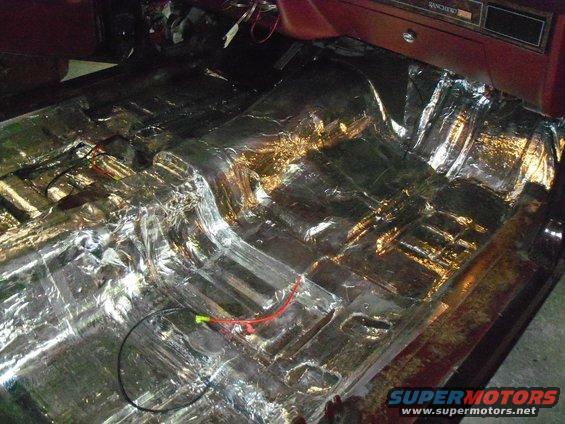 This is a 77 Chero and since I have new seats via Andy down in Ocal, FL I'm looking at the install and figured new carpet and sound deadening. Either EVA on the carpet and/or deadening or just EVA or just deadening. What say you? FWIW, I used an 80 mil sound deadener with an aggressive butyl adhesive on my entire floor, took 25 sq ft, the deadener had a 7 mil thickness aluminum layer, somewhat a PITA to conform this thickness to all the contours but the results were well worth the effort. ACC is decent carpet, from what I have read they have a better version(thicker carpet/heavier weight) for our rides now. There is also carpet with added mass backing, I haven't dealt with it, but the added mass can possibly be an issue with conforming to the floor boards as compared to the "regular" backed carpet. Good luck in whatever you choose. I used ACC on my '67 F250. Unfortunately, the top edge of the carpet was ~1" short, so I have (at least) a 1/2" gap on each side along the top. Along the bottom, it's fine. Not the fault of the carpet, but immediately after installing it, my heater core decided to fail, so I dumped the green radiator fluid on my green ACC carpet. It did stain. But since ACC is the only game in town for the trucks, I'll probably go with them again. So, my advice is to pay attention to the vendor's policies as much as the carpet manufacturer. On a positive note, it wears like iron! Personally, I recommend black. I purchased new carpet from ACC couple years ago for a 69 Ranger. Carpet fit perfect, great quality, and looked perfect. I did let it sit out flat on my shop floor in the heat for 24 hours. HVAC, good info. Hoping the whole thing will drop right in but of course it never does. When I got my Ranchero, the PO had redone the interior. Black carpet, black headliner, black sunshades. I live in the desert, and I thought the black would cook me. But the door panels and bench seat are done in a plush silver/grey, so it really works well, and looks good, too! Ace to the King on that, Colnago! My F150 is black on black, hot as hell in the North Carolina summers. I swear I will never get another black vehicle. Joseph, you got interior pics? I have really nice dove grey seats and am thinking about going Grey/Black on the interior to go with the gloss blacked out body. I'll try to take some after work for you. Pretty crappy photos, but I hope they will show how awesomely cool my 'chero is. Cool to look at, cool to drive, but not cool to ride in, 'cuz I don't go no A/C. LSChero and Doc76251 like this. It was panels, IIRC they were 16" square. I would have absolutely hated to install big sheets of it, the butyl adhesive was so aggressive it would just about pull the factory paint off the floor pans if I had to move/remove a piece to "adjust" it. I have purchased several items from Stock Interiors (carpet, headliner and something else???) and have always been pleased with their products and service. I plan to purchase some black floor mats from them hopefully in the not too distant future. They will mail to you samples if you request them. I just recently purchased the navy carpet with back from ACC. I have not installed it yet though, I'm waiting for the car to come back from paint. The carpet seems like it is made well and the color will look great. I am planning to buy NICO sound mat and do the floor and doors. @aquartlow did you cover the "trunk" space also for 25sqft? Did you do the doors also? I saw the pictures of your subwoofer set it up, looks great! I didn't have enough to do the subwoofer enclosure, I used a spray on deadener in there. The doors, roof and back panel above the subwoofers were done years previous with a Dynamat product(so many options I do not remember which one, but it does work). 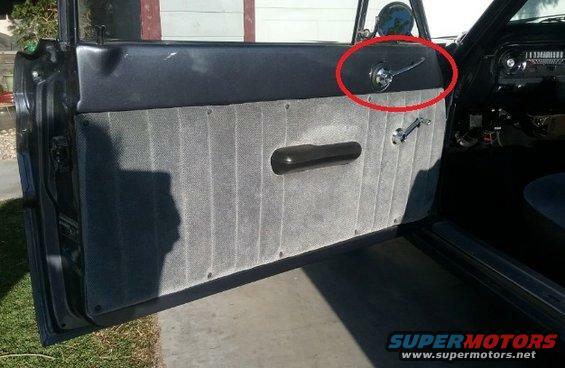 Joseph, I'm digging your door panels! The window crank is in the right spot but tell me about the (I A$$Ume) door handle mounted way up high. Is that the stock location? I like that a heck of a lot better than my configuration! Which backing did you get? Did you get the "plush" carpet? I'm kind of at a cross roads with the NICO mat and adding the EVA backing or the jute or leave it plain. Thanks for the complement. I think the PO had a better handle on the aesthetic than the mechanical items. I'm still tweaking, but she runs so much better now than when I first brought her home. The armrest is at the correct height (I've had the door panel off a few times). There are two sets of mounting locations, about 2" apart front-to-back. If the armrest was any lower, it would probably hit the seat. Complete change of topic, but I read a post somewhere else that suggested a '65 Ranchero could smoke a '65 Mustang, because the Mustang weighed an extra 500 lbs. I googled it, and the Mustang is heavier, but only by around 100 lbs. Maybe if I get a 4BBL intake and carb, I could show 'em who's boss, but as she is right now, she probably won't win any races. I got the plush carpet. Also decided to go ahead and get the NICO mat. Hopefully with the NICO mat and the backing it will layout fine. Got some pics of my car from the painter, almost finished so as soon as I get it back I'll be doing the carpet and sound deadening. Joseph, not the arm rest the door handle. Mine is down near the arm rest. Of course I have no idea what year yours is either.